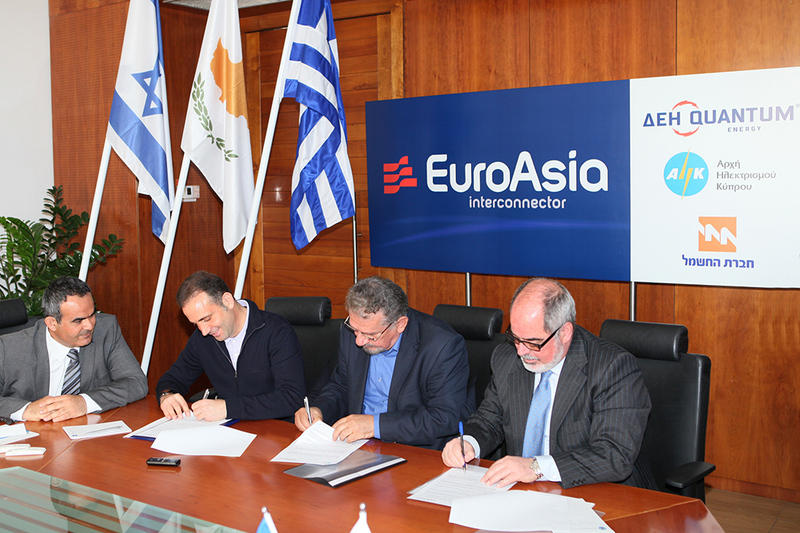 The Electricity Authority of Cyprus formalized today its participation in the three-nation operation to lay the EuroAsia Interconnector submarine electricity cable. This energy bridge links together the countries of Israel, Cyprus and Greece, thereby expanding the pan-European electricity grid. 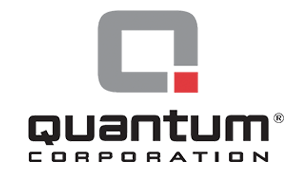 In a modest but packed ceremony at the head office of the EAC, the organization’s president, Mr. Harris Thrasou and the Director General, Dr. Stelios Stylianou, signed a cooperation agreement with the Chairman of PPC – Quantum Energy, Mr. Nasos Ktorides. 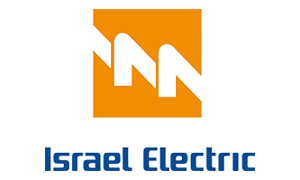 Today’s signature by both parties is the continuation of a similar agreement signed with the Israel Electric Company earlier this month. The government officials of Israel recognize the importance of the project in fulfilling their long-term strategic plan for opening up the energy frontiers of their country. 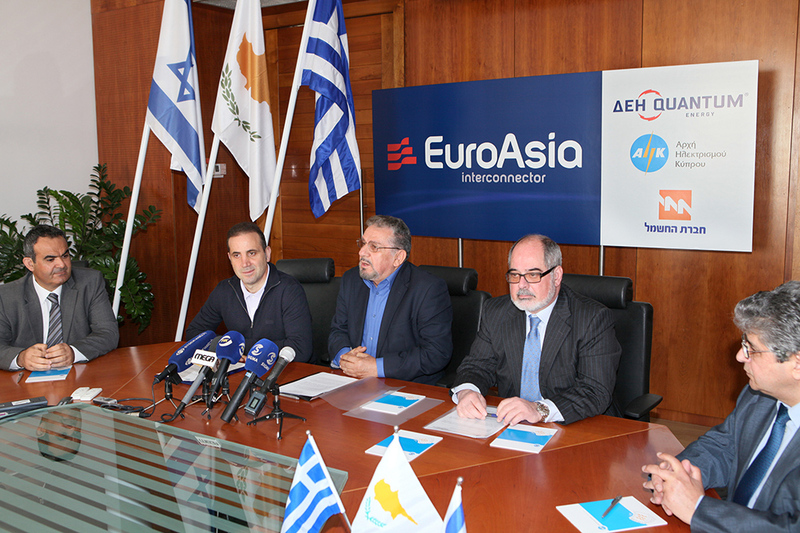 Through communications prior to the signing of the agreement, it was made clear that the national electricity companies of Greece, Cyprus and Israel are treating the task as being of the highest national importance “not only for the sake of prosperity and the energy sector but also for the security of their countries.” The work is therefore progressing at a fast and decisive pace so that the intercontinental bridge can begin operating in 2016. At present, the project is at the feasibility stage which is expected to be completed earlier than the end of this year as was originally announced. Initial indications from the experts confirm that the project, albeit one with extremely demanding and unprecedented specifications, is technically feasible. We should remember that this is the first time in the energy era that a cable of the length, depth and power of the EuroAsia Interconnector will have been laid. The European Union, through its Energy Commissioner, Mr. Günther Oettinger expressed its support for the project and its contribution to the energy efficiency of the Community. In addition, the Greek Minister of Energy, Mr. Papakonstantinou, and other important political actors in Greece have expressed the will of the Greek state to facilitate whatever permits are necessary for the smooth and timely implementation of the project. It was also stressed that top state electricity companies have already expressed interest in the advance purchase of electricity through the EuroAsia Interconnector electricity bridge. The first meeting of Project Steering Committee is scheduled for 23 April to roll out the next steps in the implementation of our programme.